Be the first to share your favorite memory, photo or story of Valdomiano. This memorial page is dedicated for family, friends and future generations to celebrate the life of their loved one. Valdomiano Linares, beloved husband of Carmen; loving father of Anel Linares (Jesus Garcia) and Marcia Linares, cherished grandfather of Miguel Garcia and Jessica Garcia. Funeral Monday 9:00 a.m. from Linhart Funeral Home, 6820 West Cermak Road, Berwyn, IL to Mary, Queen of Heaven Church. Mass 10:00 a.m. Interment Queen of Heaven Cemetery. 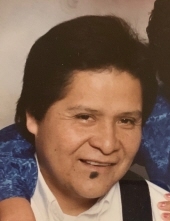 Visitation Sunday 3 to 8 p.m.
To send flowers or a remembrance gift to the family of Valdomiano linares, please visit our Tribute Store. "Email Address" would like to share the life celebration of Valdomiano linares. Click on the "link" to go to share a favorite memory or leave a condolence message for the family.